Over the past month, DC Comics has been publishing a crossover between Tom King’s Batman run and Joshua Williamson’s The Flash entitled The Button. This crossover picks up from where the DC Rebirth One-Shot left off, with Batman and the Flash discovering the Comedian’s (from Alan Moore’s Watchmen) smiley-face button stuck in the wall of the Batcave. The crossover follows Batman and the Flash as they try to track down the source of the radiation being emitted by the button while facing off against a series of personal and emotional obstacles thrown their way, seemingly on purpose. American Gods: Shadows #2 is the latest issue of Dark Horse’s adaptation of Neil Gaiman’s novel, American Gods. It, essentially, adapts the entire second chapter of the original novel pretty faithfully. In this issue, Shadow and Wednesday continue their conversation at Jack’s Crocodile Bar, Shadow meets the leprechaun Mad Sweeney and has an altercation with him, and Shadow attends his wife’s funeral. I’ve got sort of mixed feelings about this issue. It’s good, don’t get me wrong, but it’s starting to feel like there’s no much actual adaptation going on. It’s pretty much a copy-paste of the original novel with some really beautiful illustrations added in. And that’s not a bad thing, per say. But it doesn’t really feel like we’re getting anything new here. 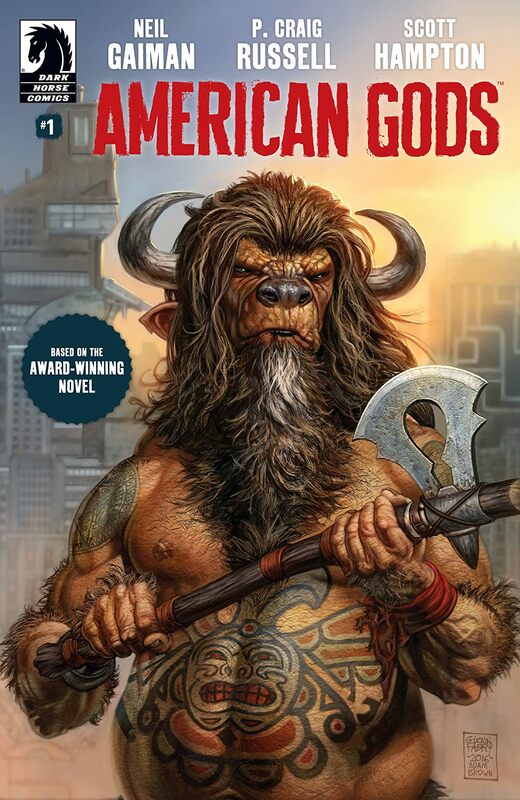 This first issue of Dark Horse Comics’ adaptation of American Gods covers essentially the entire first chapter of the book without any deviation. Much of the narration from the book is kept in the comic, done as word boxes on panels describing the action. The artwork itself is good. It’s definitely a style you have to get used to, but once you get used to it it’s really quite beautiful. In terms of writing, it doesn’t seem like P. Craig Russell has done much aside from copy and abridge the original language of the book. Which is fine – it’s often better to not fix something that isn’t broken.